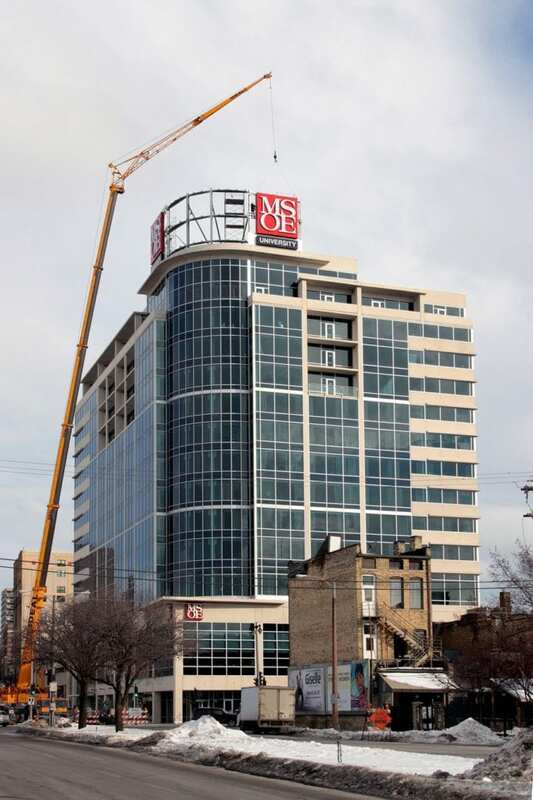 Located in the heart of downtown Milwaukee, the Milwaukee School Of Engineering’s tower / dormitory and it’s new signage are highly visible to large volumes of pedestrian and motor traffic, helping the university reinforce its brand image. The top of this university signage is 160′ above the street. – The red MSOE cabinet is 16’ x 16’ x 16” deep fabricated aluminum cabinet w/ SignComp bleed tensioning frame. – Translucent Dark Red Cooley Brite II 20oz flexible faces. – Internally illuminated w/ 250’ of Osram/Sylvania 6500K 24v Single Sided Box LED’s. – Letters are 13’-3” tall x 5” deep welded fabricated aluminum w/ white polycarbonate faces mounted flush to cabinet flexface to internal framing on backside of flexface. – Letters are internally illuminated w/ 200’ of Osram/Sylvania 6500K 12v Backled Medium LED’s. – The “University” cabinet is 3’-4” tall x 16’ wide x 16” deep fabricated aluminum cabinet w/ routed aluminum faces, white polycarbonate back-up at copy w/ ¾” thick clear acrylic pushed-thru. It is internally illuminated w/ 32’ of Osram/Sylvania 6500K 24v Single Sided Box LED’s. – The red MSOE cabinet w/ letters and “University” cabinet together contain approx. 350’ of 16 gauge secondary wiring going through the precast wall to the secondary hook-up box directly behind the sign.